It’s a self defeating myth to believe that asking for help is a sign of weakness. Sadly, most of us do not understand that as a human race, we are all a part of one family and we do need each other. If there is a box high on a shelf that you can not reach you would not hesitate to grab a step stool. It is the same with life, at certain times you need someone to help you reach the high places. I do understand that the fear of rejection is the main reason why you feel you can not ask for help. Asking for help places you in a place of vulnerability that many women believe is a sign of weakness. It is not. Asking for help is a sign of strength due to the fact that only those who do not want to prosper sit idly in one place, placated by misery. You want to rise up from a dark situation. To do so, you will need help and you are strong enough to go get it. At times you may feel as though no one cares about you. You may also feel that no one could help with your situation at all so why ask. You could feel that by asking for help you are obligated to return the favor and you cringe at the thought because you believe you have nothing to offer back. 1) The ability to help someone is a blessing. 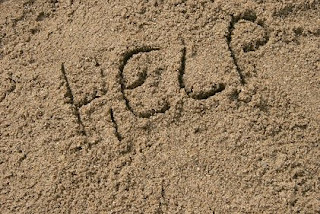 By asking for help and allowing a friend to come to your aid you are investing in their self worth. Many people do not have the ability to help you so someone who can help, and loves you, can appreciate that they have the ability and consider it a blessing to be able to help. 2) By being open to receive help you are allowing your own life to be enriched. You will learn that there are people who care and this will restore your faith in humanity. You will also be exposed to the many different ways in which people handle their problems and your skill set for problem solving will expand. Once you receive the help you need you can renew your own life and in turn position yourself to be a blessing to others. 1) Search for people who have been through your situation and ask them for their solutions. Find a support group or post an ad online. If you can not find anyone who has successfully navigated through your situation, then you can create a group yourself. 2) Call an emotional crisis hotline. There are many suicide and crisis prevention hotlines operating 24 hours a day with trained volunteers who have lists of resources that can help you to move through your troubled times. Even if they can not offer immediate assistance you can feel the relief of at least being heard. Sometimes the act of speaking aloud your frustrations helps you to sort through them. 3) Call a friend who cares. When was the last time that you felt supported? Who was the person standing with you? If there is a person in your life who supported you once, please do yourself a favor and reach out to them again. I know you may not want to ask because you do not want to feel needy or desperate or pathetic but the reality is, your own health and happiness depends on your being able to receive help and you never know when that friend’s life may take a turn and you can feel the honor of being able to assist them. Accept the help. When you ask for help and your request is denied, it is not a permanent No. It is simply a way to show you how to look for other creative solutions to the problem. Every problem is really a project. Look at life’s situations in this way and plot your way out of the project and onto the next phase of your life. Do not become angry with the person who turned you down if they are unable to help you in the way that you need. It was not a personal attack against you. If it were meant for them to help, they would. Your life may be being re directed in another direction, towards a solution more bright and more beneficial to you. When you are in a crisis situation and you need help you may experience anxiety. Anxiety is a fearful feeling that causes physical symptoms like rapid breathing, a burning feeling in your chest or depression and sadness. These feelings are normal. You feel this way because you feel like you do not have control over your life. Most of us want to dictate life so that we never experience this feeling but we can not. Just as much as we appreciate the bliss of happy surprises, we should also welcome it’s contrast- fear of the unknown. 1) Remind yourself that nothing is permanent. This feeling is overwhelming right NOW but, right NOW is temporary. This will pass. After this feeling is done, you will never have to live this moment again. 2) Take a shower. A warm shower while playing your favorite most relaxing music will give you the sensation that you are being touched and caressed and sometimes a touch is all you need to calm down. 3) Indulge yourself. You have permission to take a moment to indulge yourself in a mindless, selfish activity that brings you joy. You do not need to punish yourself by withholding good experiences until you have solved your problem. The relief you experience by having ‘fun’ may be what you need to be able to think more clearly and resolve your issue. I love you. Take care of yourself. Ask for help when you need it. You deserve it. And remember, once you are out of your hole, you can be free to give back.